Click on any Sodalite Specimen image below to enlarge it. 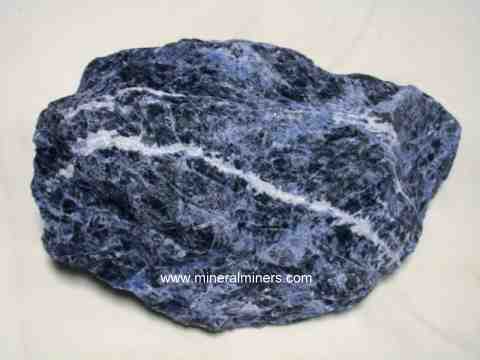 Try our Sodalite Mineral Specimens Satisfaction Guarantee - compare our prices and our superior quality. Sodalite Dimensions: 10.5" x 8" x 4"
This boulder of natural sodalite rough weighs 10.7 pounds, and it has rich blue natural color with beautiful white veins. It could yield several spheres along with plenty of scraps for smaller carvings, cabs, etc.. See also an opposite side view of this natural color sodalite rough specimen. This large sodalite piece would also make a great decorator specimen for indoor or outside display just as it is. This boulder of natural sodalite rough is 13.5 inches long, and it has rich blue natural color with beautiful white veins. It could yield several spheres along with plenty of scraps for smaller carvings, cabs, etc.. See also an opposite side view of this natural color sodalite rough specimen. This large sodalite piece would also make a great decorator specimen for indoor or outside display just as it is. Sodalite Dimensions: 11" x 9" x 6.5"
This boulder of natural sodalite rough weighs 22.9 pounds, and it has rich blue natural color with some beautiful white veins. It could yield several spheres along with plenty of scraps for smaller carvings, cabs, etc.. See also an opposite side view of this natural color sodalite. This large sodalite piece would also make a great decorator specimen for indoor or outside display just as it is. Sodalite Dimensions: 13.5" x 9.5" x 6.5"
This boulder of natural sodalite rough weighs 27.0 pounds, and it has rich blue natural color with some beautiful white veins. It could yield several spheres along with plenty of scraps for smaller carvings, cabs, etc.. See also an opposite side view of this natural color sodalite decorator mineral specimen. This large sodalite piece would also make a great decorator specimen for indoor or outside display just as it is. Sodalite Dimensions: 14.5" x 10.7" x 7"
This boulder of natural sodalite rough weighs 28.0 pounds, and it has rich blue natural color with some beautiful white veins. It could yield several spheres along with plenty of scraps for smaller carvings, cabs, etc.. See also an opposite side view of this natural color sodalite decorator specimen. This large sodalite piece would also make a great decorator specimen for indoor or outside display just as it is. This is the end of our Natural Blue Sodalite Mineral Specimens virtual gallery page. We have many other mineral specimen varieties available! To see more sodalite photos, just select another item category from the table below. To see photos of another mineral variety, select any item category link in our Mineral Inventory & Factsheet Index. Would you like us to inform you when we add on this page more natural color blue sodalite mineral specimens? We have additonal inventory of natural color blue sodalite mineral specimens in stock at our mineral warehouses including specimens of rare extra large size weighing hundreds of pounds each, so be sure to let us know if you have any special requests. Please contact our webmaster or our 'site' geologist with any questions or comments. © Copyright 1998-2017 Gem & Mineral Miners, Inc.® All Rights Reserved.